Nothing is more personal than the money you earn or save for the future. At River Cities Bank, your financial safety and security is our top priority. Our Fraud and Security Center offers practical tips for your personal finances, as well as advice for business owners. Spoofing generally comes in two forms: emails and websites. Spoofed emails appear as though they are from a legitimate source, such as River Cities Bank or a credit card company. It may look like a legitimate email, but the purpose is to get you to click a link that takes you to a spoofed website. Again, it may have the right colors and logo to match the company’s brand. However, the website’s purpose is to find ways to get into your computer to find personal or financial information. Phishing is the act of using a spoofed email and website to trick you into offering up confidential information. In emails, this may be phrases like “We need you to confirm your account number” with a button or link to click. Doing so may give the criminals access to your computer to be exploited. Pharming occurs when criminals redirect website traffic from a legitimate website to a spoofed website that looks exactly like the legitimate company website. This is done to trick users into entering personal or account information that can then be used by criminals to open accounts in your name or steal your money. Vishing attacks are focused on getting you to provide personal information over the phone through voice calls or through your phone’s Internet browser. These calls are often automatic voice greetings that try to trick you into providing your debit card or bank account numbers. Tech scams usually involve a phone call claiming to be a computer tech associated with well-known companies like Microsoft or Apple. Other scammers will send pop-up messages to your computer that warn of computer problems. They say they've detected viruses or other malware on your computer. They claim to be "tech-support" and will ask you to give them remote access to your computer. Eventually, they'll diagnose a non-existent problem and ask you to pay for unnecessary- or even harmful- services. If you get an unexpected pop-up, call, spam email, or other urgent message about problems with your computer, STOP. Do not click any links, do no give control of your computer, and do not send any money. Identity theft is a devastating crime that can take many years, a lot of money and a large amount of stress to recover from. 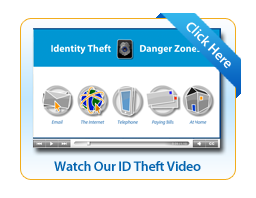 Our Identity Theft Prevention video shows you the different ways you may be vulnerable to identity theft, as well as how to take steps to prevent it from happening to you. Identity theft isn’t just for individuals, it can also happen at work. Criminals can infiltrate your network and take advantage of you or your employees to take over your business’s finances, a process called Corporate Account Takeover (CATO). 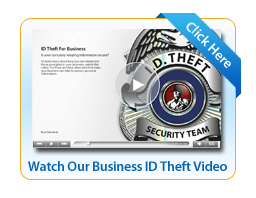 Our Business ID Theft video shows how to prevent CATO from happening, as does our collection of CATO prevention resources.